As a child I watched in awe as my uncle, an art student, drew sketches of birds, donkeys, and horses. Now I realize that what captivated me, and still does, was not so much the animals he drew but the act of creating. To this day, this is what compels me to paint. I derive great satisfaction from being able to create an image, a scene, a figure, an illusion of reality using mere paint and brushes. The subject matters little; the creative process becomes everything. I started out using acrylic paint but, over the years, the responsiveness, versatility and texture of oil have won me over. I like to see every brushstroke in my work so I use bristle brushes and very little medium. My favorite color is now orange; I find myself drawn to its warmth and radiance. Usually I begin a piece by staining the canvas with a light coat of red using turpentine. Next I block in large areas using the complementary color of the object or scene I want to paint. 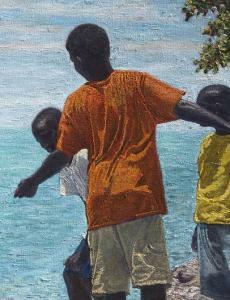 Then I draw in the scene, object or figure, using burnt sienna and cerulean blue. I continue adding layers, building the texture, working from dark to light until I achieve the desired result. My current work is bright and bold; I am discovering how powerful color can be. Each time a painting develops and takes on a life of its own, I am filled with a sense of exhilaration. As I continue to create art, I draw much inspiration from the Creator, the most neglected artist of all time.